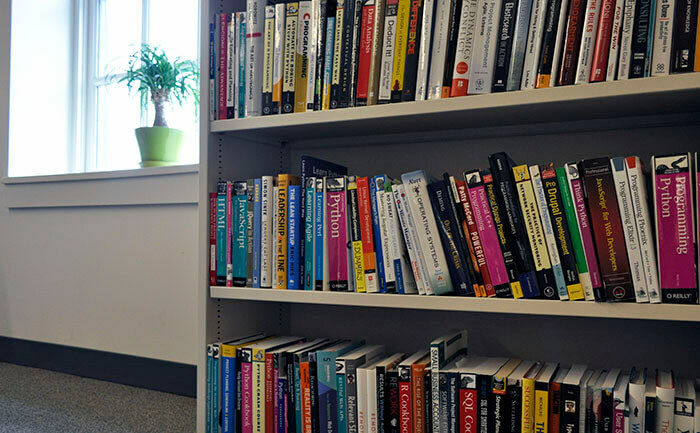 Pictured: Our library of reference books at Caktus cover topics including Django and Python, as well as project management and Agile methodologies. At Caktus, we believe in continued learning (and teaching). It's important to read up on the latest industry trends and technologies to stay current in order to address our clients' challenges. We even maintain a library in our office for staff use, and we add references frequently. Our team enjoys sharing what they've learned by contributing to online resources, such as the Django Documentation and the Mozilla Developer Network Web Docs. Below is a list (in alphabetical order) of the books, blogs, and other documents that we’ve found to be the most accurate, helpful, and practical for Django development. Overview: When Dmitriy first began learning about Django, he went through the official Django tutorial. Then, as a developer, he read through other pieces of documentation that are relevant to his work. A Valuable Lesson: Dmitriy learned that detailed documentation makes working with a framework significantly easier than trying to figure it out on his own or from other developers’ posts about their errors. The documentation is readable, uses understandable language, and gives useful examples, making Django Documentation a lot friendlier than Dmitriy expected. It encouraged him to continue using it, since other core developers consider it important to make their software usable and well-documented. One thing that’s particularly helpful about the Django documentation is that pages now have a ‘version switcher’ in the bottom right corner of the screen, allowing readers to switch between the versions of Django for a specific feature. Since our projects at Caktus involve using a number of different versions of Django, it’s helpful to switch between the documentation to see when a feature was added, changed, or deprecated. Seeing the documentation on the Django Documentation site also encouraged Dmitriy to thoroughly document the code he writes for people who will work with it in the future. Why You Should Read This: The Django tutorial is a great place to begin learning about using Django. The reference guide is best for those who are already using Django and need to look up details on how to use forms, views, URLs, and other parts of the Django API. The topic guides provide high-level explanations. Overview: The Django User’s Group is a public Google Group that Karen found when she first started using Django in 2006 and ran into some trouble with database tables. She posted her challenges and questions on the Google Group and received a response the same day. She’s been using Django ever since — coincidence? A Valuable Lesson: Django Users was Karen’s first introduction to the Django community and she learned a great deal from it. It was also her entry into becoming a regular contributing member of the community. Why You Should Read This: If you have a Django puzzle that you can’t solve, searching the group and (if that fails to yield results) writing up and posting a question is a great way to get a solution. Karen also notes that sometimes it’s not even necessary to post since the act of writing the question in a way others can understand sometimes makes the answer clear! Reading various posts in the group is also a way to see the issues that trip up newcomers, and trying to solve questions by others also provides helpful learning opportunities. Overview: High Performance Django, proclaims to “give you a repeatable blueprint for building and deploying fast, scalable Django sites.” Neil first learned about this book from friend and former coworker Jeff Bradberry, who pointed it out as a way to start pushing his Django development skills beyond a firm grasp of the basics. A Valuable Lesson: Neil learned that making Django perform at scale means keeping the weight off Django itself. 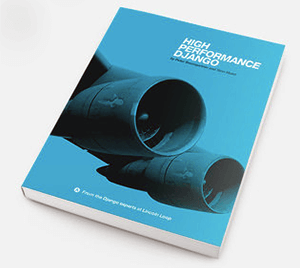 The book taught him about making effective use of the high-performance technologies that make up the rest of the stack to respond to browser requests as early and quickly as possible. It taught him that there’s more to building web apps with Django than just Django, and it opened the door to thinking and learning about many other features of the web app development landscape. Why You Should Read This: This book is ideal for anyone who’s beginning a career in web app development. It’s especially helpful for those with a different background, whether it’s front-end development or something further afield like computational linguistics. It’s easy to lose sight of the forest for the trees as a new web developer, and this book manages to provide you with a feel for the big picture in a surprisingly small number of pages. Overview: The Mozilla Developer Network (MDN) Web Docs are a popular resource when it comes to nearly any general web development topic. It’s authored by multiple contributors, and you can be an author, too. Vinod usually visits the site when he’s struggling with a piece of code, and the MDN pops up at the top of his web search results. Caktus especially loves the MDN because we were fortunate to work with Mozilla on the project that powers the MDN. Overview: Towards 14,000 write transactions per second on my laptop, is a relatively short blog post that provides an overview of two little-discussed Postgres settings: commit_delay and commit_siblings. A Valuable Lesson: This post not only provides an overview of commit_delay and commit_siblings, but also an important change to the former that dramatically improved its effectiveness since the release of Postgres 9.3. For database servers that need to handle a lot of writes, the commit_delay setting (which is disabled by default, as of Postgres 11) gives you an efficient way to "group" writes to disk that helps increase overall throughput by sacrificing a small amount of latency. The setting has been instrumental to us at Caktus in optimizing Postgres clusters for a couple of client projects, yet Tobias rarely, if ever, sees it mentioned in more general talks and how-tos on optimizing Postgres. Why You Should Read This: These settings will change nothing for read-heavy sites/apps (such as a CMS), but if you use Postgres in a write-heavy Django (or other) application, you should learn about and potentially configure these settings to improve the product. 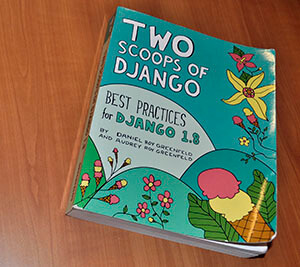 Overview: Two Scoops of Django has several editions, and the latest is 1.11 (Dan read edition 1.8). The editions stand the test of time, and the authors go through nearly all facets of Django development. They share what has worked best for them and what to watch out for, so you don't have to learn it all the hard way. The authors’ tagline is, “Making Python and Django as fun as ice cream,” and who doesn’t love ice cream? A Valuable Lesson: By reading the Django Documentation (referenced earlier in this post), you can learn what each setting does. Then in chapter 5 of Two Scoops, read about a battle-tested scheme for managing different settings and files across multiple environments, from local development to testing servers and production, while protecting your secrets (passwords, keys, etc). Similarly, chapter 19 covers what cases you should and shouldn't use the Django admin for, warns about using list_editable in multi-user environments and gives tips for securing the admin and customizing it. Why You Should Read It: The great thing about the book is that the chapters stand alone. You can pick it up and read whatever chapter you need. Dan keeps the book handy at his desk, for nearly all his Django projects. The book is not only full of useful information, but almost every page also includes examples or diagrams. We recommend these readings on Django development because they provide valuable insight and learning opportunities. What do you refer to when you need a little help with Django? If you have any recommendations or feedback, please leave them in the comments below.